Dress the potatoes while they’re still warm, but wait to add the mint until the potatoes have cooled off —otherwise the mint will turn dark and you'll lose the green that makes the salad so pretty. I love the healthy quotient of this dish: vegetarian, vegan, gluten-free! 1. Cook the potatoes: place them in a large saucepan and cover by 1 inch with cold water. Add a teaspoon of salt. Cover and bring to a boil. Remove the lid and reduce the heat to medium. Test a sample of the potatoes every minute or so with the tip of a paring knife. They are ready when the knife cuts into the potato with just a hint of resistance. Taste the samples, looking for an al dente quality. Russet potatoes cook in about 13 minutes. Be careful not to overcook the potatoes or they will turn to mash when they are stirred with the dressing. 2. Drain the potatoes and place in a medium bowl. Season the warm potatoes with salt, lemon, and olive oil, stirring very gently. Taste and adjust seasonings. When the potatoes have cooled down almost to room temperature, add the scallions and mint, stirring gently to combine. 3. 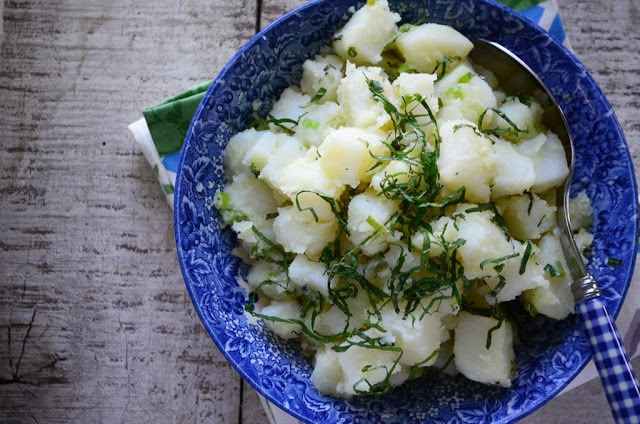 This potato salad is delicious warm, as well as the next day (cover and refrigerate over night. Bring to room temperature and add more fresh mint, again stirring gently).